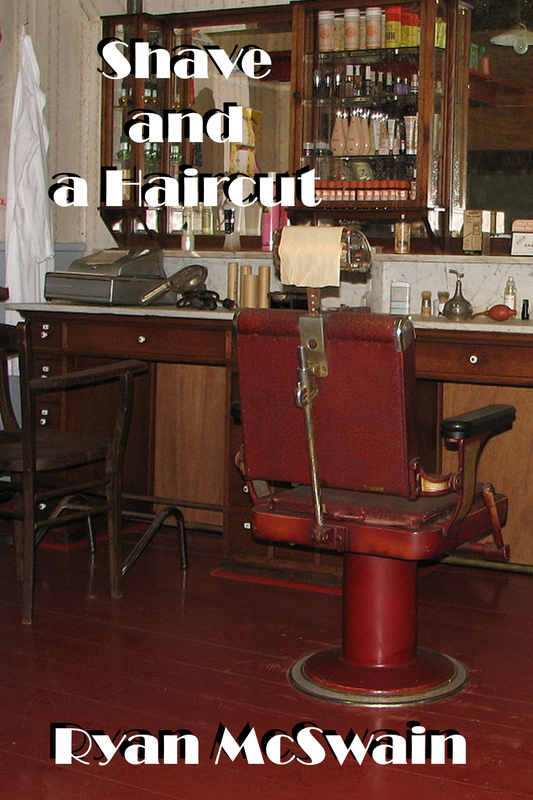 On a stormy night, a face from the past turns up at the barbershop. A subtle drama with a hint of mystery. Subscribe now to the McSwain Monthly Missive for fun recommendations, useful links, and free short stories. If you missed out on last month, don’t you worry none. Starting Wednesday, new subscribers can download past stories on a special archive page. How cool is that? I’ll tell you how cool. 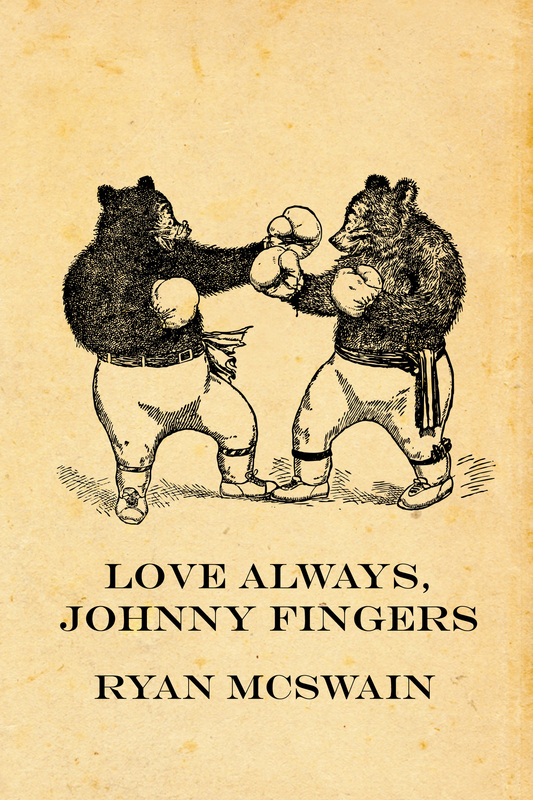 As cool as last month’s story, “Love Always, Johnny Fingers.” It’s a 1920s boxing story with all the logic of a Looney Tunes cartoon. Check out the cover. I know I’ve been neglecting the blog, but another post should be up by Friday. New for the Mailing List: Short Stories! I haven’t been doing much with my email list–or the blog, for that matter–and I apologize. But I’ve finally got a handle on it. Each month subscribers will receive an email with updates and fun recommendations. But what I’m really excited about will be the free short story. Each email will include download links to a new story. Some are a bit Twilight Zone, some are good ol’ slice of life, and some defy description. But I think you’ll enjoy them, so please sign up for the mailing list if you haven’t already. I’ll have the first story out before the end of the week. I have some great stories to share with you. And be on the lookout for news on my next book. Wheels are in motion. I had the opportunity to be interviewed by Drew Powell for a local news story about stay-at-home dads. He was even kind enough to let me plug my book. But let this be a lesson to you: never shave your beard, because that’s when someone will want to put your naked chin on the television. Cerebus is a 300-issue, independent comic book by Dave Sim and Gerhard, published from 1977 to 2004. 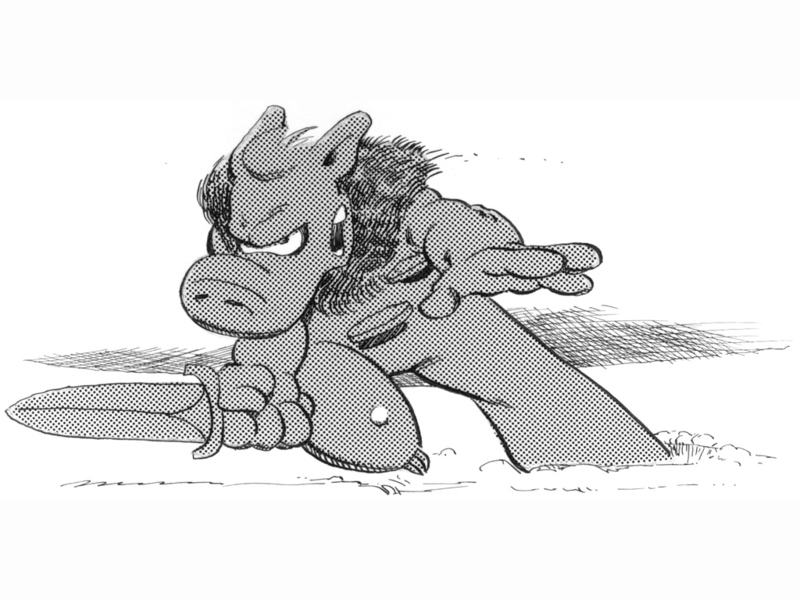 It tells the story of Cerebus the Aardvark, who starts out as a parody of Conan the Barbarian. Through the course of the story, Cerebus becomes many things, including a prime minister and the Pope, and the massive 300-issue run comprises a single, complete story. Gerhard started doing his immaculate backgrounds with #65. Dave Sim wrote the book, drew the characters, did the mechanical tones, the layout, the balloons, and the lettering. Both artists inked their own stuff. I first heard about Cerebus in Spawn #10–I know, I know–and I started reading the phone book-sized reprint volumes in high school. Like so many other, I was blown away by Dave Sim’s growth as an artist in the first twenty-five issues. I read and reread that first volume, laughing out loud at the brilliant humor each time. Over the years, I slowly acquired new volumes in the series. High Society, Church & State, Jaka’s Story, Melmoth. Each one was special in its own way. I read up through Rick’s Story (issues 220-231) before taking a long break. 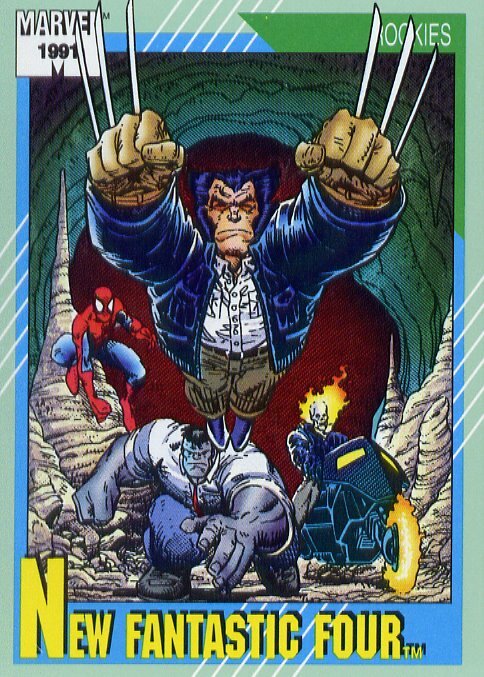 This was about the time the series ended at issue 300. For years, with a mixture of excitement and hesitation, I’d looked forward to reading the entire series. You see, I have this weird thing about finishing a series I love. When I know it will be the end–that there will never be any more, not ever–I don’t want to finish it. There are several dead authors that I love, and I usually leave one of their books unread. 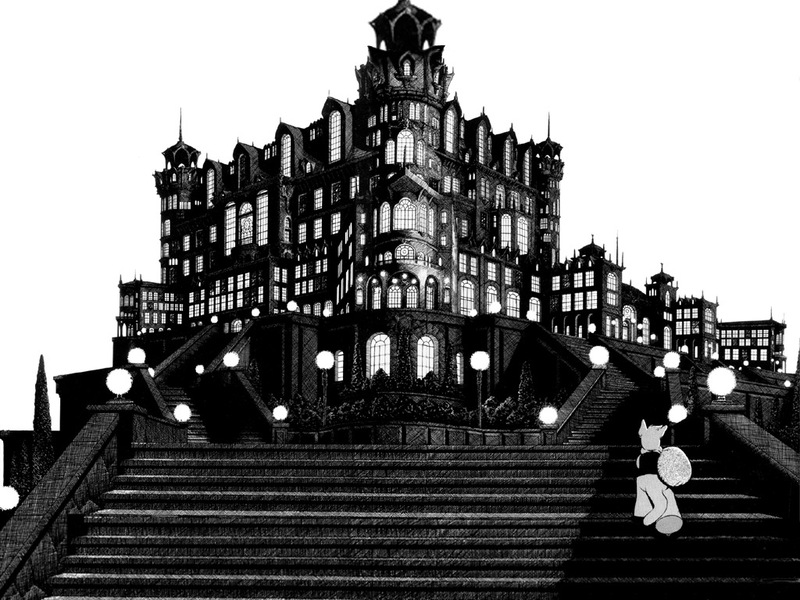 So I decided to reread Cerebus and to finish it. I’d somehow avoided having the ending spoiled for ten years, but I knew, eventually, someone would give it away (don’t worry–I won’t spoil anything here). I’d never met anyone else that read the book (without my having introduced them to it), and I’d steered clear of any news about Cerebus since I started reading it in the late ’90s. I had no idea where the book was going in the final stretch. Some of you, however, might see where this is going. The first volumes were as amazing as I remember them. High Society and Church & State still floored me. Jaka’s Story was just as gripping, Melmoth just as unusual and interesting. The text pieces on creators’ rights and self-publishing, which I had never read before, were inspiring. I’m not sure where I realized what was really going on. I’d heard it said “Dave Sim is a Misogynist,” but I assumed that was a reaction to the male light and female void symbolism. Alexander Adrock, a great guy I follow on Twitter, said he wasn’t planning to read the book because of Sim’s opinions on women. Folks are just oversensitive, I thought. I even signed the “I don’t believe Dave Sim in a misogynist” petition. In the full read-through, Sim started making remarks about feminism in the letters pages, but they weren’t that offensive. There are a small minority of feminists that believe men are a waste of genetics, and he may have been sick of hearing about it. I could see a guy in the 1980s feeling that way. Then he says in the letters page of #171 that “women and government don’t mix.” On the next page, he mentions the Feminist/Matriarchist agenda. Uh-oh, I thought. Issue 186 is a watershed issue. In a lengthy text piece, Sim inserts himself into his work as Viktor Davis and says things you would have to read to believe. The fact that I did not catch it when I read through Reads in my early 20s shows how much I was willing to overlook. I must have thought that it wasn’t what Sim really believed, that this author surrogate was a parody of people’s perceptions. His fear of the feminist/homosexualist axis and the Marxist/feminist axis. Wishes he could just date teenagers. Men should spank their wives if they misbehave (and I don’t mean in a fun way). When SARS was a big thing, he claims it is God’s judgement on Canada. He mentions that, before doing interviews for Mothers & Daughters, he had never bothered to interact with women he didn’t want to sleep with. Near the end, he blames his mother’s poor health on her being an atheist. Maybe it would be different if it stayed out of the story itself. But there’s the #186 text piece. 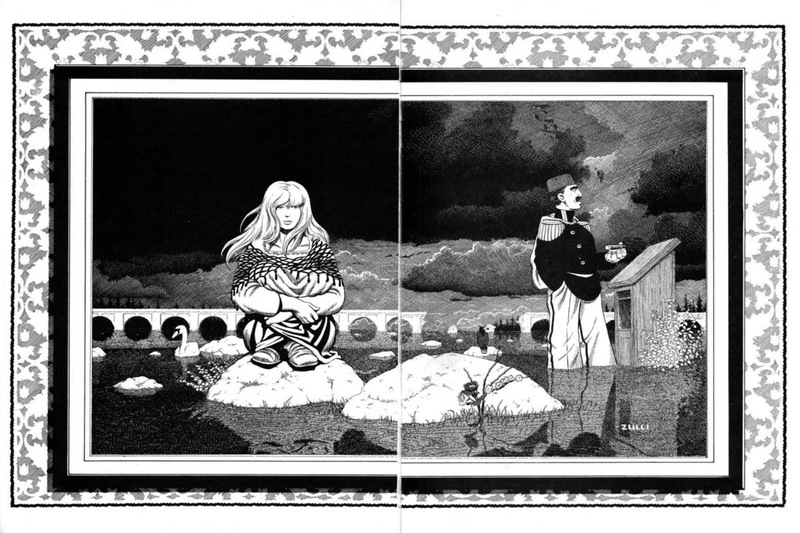 And one of Sim’s strongest female characters–one he used to respect–is turned into “a spoiled, myopic, insensitive, self-absorbed and self-important harlot princess.” In #281, Cerebus states that the Jews bring the Holocaust on themselves. Cerebus parades women in front of a roomful of men in #277, and they vote if she is “a devil, a viper, or a scorpion.” If she’s found guilty, she gets her head blown off. Sim’s opinion of “Mr. Mom” makes it clear what he would think of me. Despite being a creator and a self-publisher, my stay-at-home dad status marks me as a victim of the feminist/homosexualist conspiracy. The sad thing is, I really believe Dave Sim is the genius he wants to be remembered as. Tim Callahan puts him up there with Will Eisner, and I agree. I’m still glad I got to read the book. The experience was a valuable one. I respect Sim for his art and for self-publishing when it seemed impossible, and it breaks my heart that his opinions overshadow his brilliant body of work. We all know H.P. Lovecraft was a racist and those opinions color his work, but his stories aren’t about the benefits of lynchings. You see Sim in the old convention photographs, and you read his stories about Colleen Doran, Chester Brown, Jeff Smith, and all the others. Many have apparently severed ties. Diana Schutz, an acclaimed editor who served as his proofreader, was willing to overlook Sim’s opinions, but she resigned when Sim challenged Jeff Smith to a boxing match. Even Sim’s family, who I don’t think we hear about until his Mama’s Boy essay, seems to be estranged (going by the Chester Brown interview in #297). Does Dave Sim have the right to voice his opinions? Of course he does. And if he wants to put them in a comic book, he has the right to do that, too. But that doesn’t shield him from the public’s reaction to those opinions. I sincerely hope Dave Sim isn’t forgotten and Cerebus isn’t totally dismissed by history as a consequence of his views. So I recant my signature on the “I don’t believe Dave Sim is a misogynist” petition. It’s embarrassing to admit, but I didn’t have all the facts. 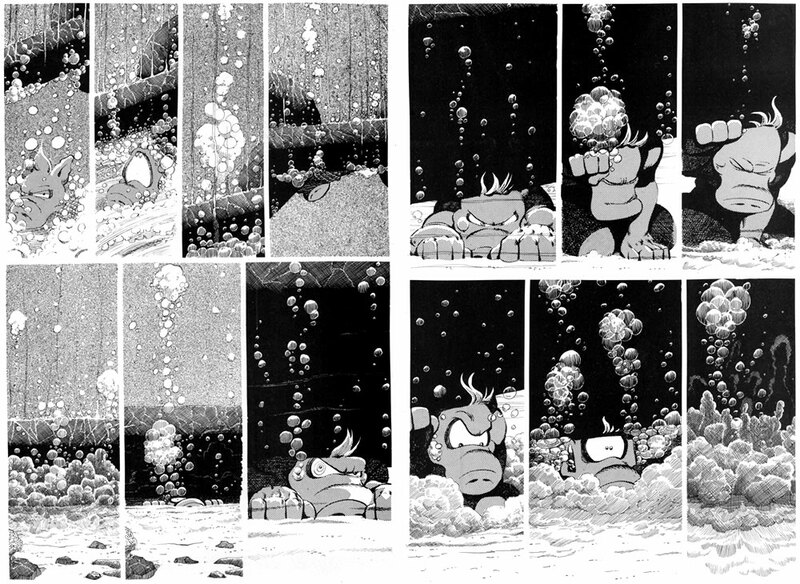 (For those interested in Dave Sim and Cerebus, the best blog on the subject is A Moment of Cerebus. Tim Callahan of Comic Book Resources also recorded his reaction to reading all 300 issues [part 1, part 2, part 3]). Josh Jordan put together a special Christmas video episode of Tell Me Another. Josh, Stephanie Bryant, PK Sullivan, and I play the free-form role-playing game Restless with the designer, J. Walton. We even had some Very Special Guests–Fraser Ronald, Avonelle Wing, and Govneh Sullivan–drop in and tell some stories. Not sure where Josh got all the time to set this up, but I’m impressed. In a Panhandle Professional Writers workshop, the speaker (whose name escapes me) mentioned selling eBooks in person. She said everyone did it “using cards” so they would “have something to sign.” According to her, some folks collected them like Marvel Universe Series 1 trading cards. Or maybe that was just how I heard it. The only true Fantastic Four. When the time came to actually make these cards, I couldn’t find any information online about how to do it. I wanted it to be automatic, with a link or a QR code (so fancy!). Dropcards is a company making something similar to what I wanted. The prices are fair but higher than I wanted to spend. So here is my cheap, professional-looking, DIY solution involving postcards and a sign-up sheet. It took about three weeks for my cards to show up from the discount printer, so give yourself as much lead time as you can. If you can get these done two months before you need them, you should be covered in case you make a mistake or there’s a printing error. First, obviously, you need your eBooks. For Monsters All the Way Down, I made .epub and .mobi files. Those will cover just about any ereader device. There’s plenty of info out there on eBook creation, but it can be a bit confusing. Someday I’ll compile a list of all the tips and tricks I compiled. Making the postcard images wasn’t difficult. Since these are going to be printed, you want them at 300 dpi. If you’re printing a physical book, your cover should already be this quality. I decided to make one side of the postcard my cover, and the other side one of the images I created for this site. The dimensions will depend on how you’re printing the postcards, and be aware that they will probably be different than those of your cover. If you don’t want to make the images yourself, talk to your cover designer. They will probably help you out, but don’t expect them to work for free. Here are lower quality examples of the two images I used, side-by-side. You’ll probably want to leave more room for the bleed than I did. Folks are divided whether the digital edition title I made is cool or stupid and impossible to read. On the side opposite the cover, I put ‘Monsters All the Way Down: Digital Edition.’ At the bottom, I wrote, ‘If you have not received an email containing your eBook files within 24 hours, please contact us.’ Under that is an email I set up for this purpose and my website. Unless you have a way of doing it cheap at home, you need to find someone who prints postcards. I needed the right balance of cheap and quality, and ended up using Vistaprint. They had a discount on postcards at the time, so they won’t always be the cheapest, but it cost me $28 for 100 cards with one discount, $35 for another 100 with a different discount. I’ve also had great results printing business cards at 123print. Here’s how the postcards look in reality. They’re bigger than they look. I have tiny doll hands. 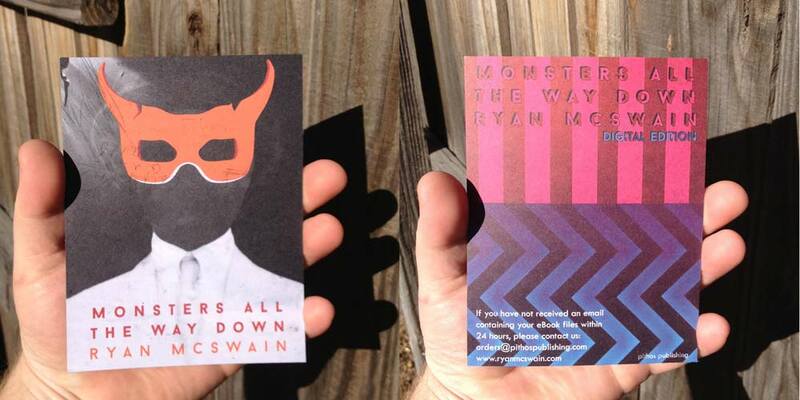 These are color, two-sided postcards printed on recycled matte. I always prefer matte over gloss, but that’s just me. If you wanted to save on cost, you could print them one-sided, and include contact information with your cover. I just preferred the look of an unmarred cover on one side. The mistake I made BOTH TI–sorry, both times I printed was that the backside was flipped. I wanted the postcard to be like a book, where you turned it over horizontally and it was still right-side up. Imagine flipping a book and the blurb is upside down. Different printing sites make it easier to avoid this mistake, but at Vistaprint I got it wrong twice. If you have any doubts at all, try and order samples or talk to someone directly at the company about what you need to do. Print a sign-up sheet asking for the customer’s name, email, and whether they would like to opt into your email list. I charged a flat $5 to make it easier to give change, and I was able to accept credit or debit cards through my phone with PayPal. Square is another popular option for accepting cards. If you’re as full of yourself as I am, you’ll want to to put your John Hancock on the cards if requested. I used a silver metallic Sharpie for this, since it showed up better than a regular Sharpie or my fountain pen. I told anyone that bought the digital edition that I’d send it that evening. Sending the email right then would be even better, but I couldn’t think of a smooth way to do that with attachments from my phone. If someone has a solution other than forwarding an email (wouldn’t that look cluttered? ), please comment below. I’ll post it here and give you credit. Here’s the text of the email I sent. Feel free to modify it and use it as you see fit. Don’t forget to attach your epub and mobi files! I sent each message out individually and addressed to the recipient. If you decide to send them out in batches, for goodness sake, use BCC instead of CC so you aren’t giving away email addresses without consent. Thank you for purchasing the Monsters All the Way Down eBook. Attached to this email are two different files, an .epub and a .mobi. The .mobi is intended for Amazon Kindle devices, while the .epub should work on other ereader devices. These files are DRM-free, meaning you can read them on as many devices as you desire. The process to add the file to your device is quite simple. Below are links explaining various methods. There are numerous other ereaders on the market. If yours is not included above, please consult the manufacturer’s website or the device documentation. Thank you again for supporting Monsters All the Way Down. If you have any problem accessing the book files on your device, please contact me. I’d be happy to help you enjoy my book. I also sold the eBooks through my site using a PayPal link. 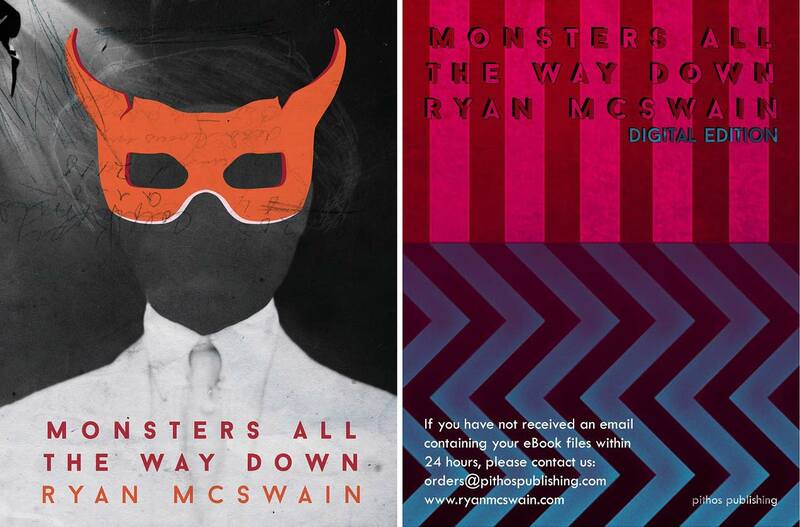 Since Monsters All the Way Down is now in the Kindle Select program, I’m only selling eBooks through Amazon. But I think the postcard method worked well when I needed it. If anyone has other suggestions for selling and delivering your own eBooks, please comment below. I help co-host Josh Jordan’s excellent podcast, Tell Me Another. It’s a show where we interview different storytellers, from epic poets to comic book publishers, from photographers to bestselling authors. We also talk about the different media we’ve been experiencing in books, games, movies, and what-have-you. Every episode ends with the guest sharing a story. Josh started Ginger Goat Press to publish his own role-playing gamebooks around the time I was pulling my hair out and trying to decide what to do with Monsters All the Way Down. His success was a huge inspiration to me. Since I took the self-publish plunge, Josh has been a huge source of advice and encouragement. I’m thrilled that I get to help with the show that he puts so much work into making great. The other co-hosts are PK Sullivan and a recent arrival, Stephanie Bryant. PK has worked on the Firefly game and others (and he has some very cool projects coming down the pike). Stephanie is a writer (check out her Handknit Heroes comic!) and also works in game design and has some cool projects on the front burner. They’re all great people, and they haven’t kicked me out yet for talking too much. Some of the episodes I’ve co-hosted include Mike Olson (Atomic Robo RPG), Lee Francis (INC Comics), Brandon Perlow and Paul Mendoza (New Paradigm Studios, publishers of the popular Watson & Holmes comic series), and Jim Butcher (author of the Dresden Files and the Codex Alera series). One of my favorites that I didn’t help with was author Jared Axelrod, particularly his recommendation of Kamen Rider Fourze, a Japanese TV show that might have made me a better person. They also had Janet Varney (voice of Korra on The Legend of Korra). Don’t remember where I was for that one–maybe I didn’t want spoilers since I haven’t finished Avatar yet. Because the hosts are also storytellers, we’ve been doing a round robin, taking turns in the hot seat ourselves. Since I like talking so much (please don’t kick me off, you guys! ), I got to go first. You can hear the interview here: Ryan McSwain Inteview Part 1, Ryan McSwain Interview Part 2. You can and should follow Josh, PK, and Stephanie on Twitter. Coming up December 1-15, Josh also has the Actual Play Festival, an online celebration of collaborative storytelling. You can get more information here. Because it will be Poop. Poop is the one who is there. And we talk about the greatest of life’s mysteries, one that has troubled both scientists and theologians since the dawn of man. Where does Poop come from? Where is Poop going? What does Poop mean? And that’s fine with me, because you would not believe the secrets I to which I am privy. Have you ever heard of a Poop Octopus? I have. Can you guess what its tentacles are made of? That’s right. They are Poop Tentacles. I listen to my son explain these things to me because I want to hear about Poop Zombies and Poop Balls. Wouldn’t you? I even manage to keep my serious face. But I also pay attention because I have an ulterior motive–I want my son to feel safe telling me things. I do it for the same reason I tell my son, when he acts suspicious, “You can tell me. I won’t get mad.” I say this out loud for two reasons. One, to remind myself not to sell my child on Craigslist when he tells me what he broke. And two, because I’m training my kid to think it is safe to tell me things instead of waiting to get caught. I don’t say, “You can tell me. You won’t get punished.” Because that might be a lie. And I don’t say “I’ll never get mad,” because sometimes my son accidentally hits me in the–let’s say in the “face”– with a plastic ThunderCats sword, and I might tell him to go to his room. I might loudly tell him to go to his room right now, and he will see said plastic sword again when I give it to him as a wedding present. I’m trying to convince my son that it’s better to tell me things. I’m hoping one day, when Poop ceases to be his biggest concern, he’ll know who he can talk to. Because there are problems even bigger than Poop Balls and there are things even scarier than Poop Monsters. But in the meantime, I’m happy to hear about Poop Cars and Poop Monkeys. Do you know what Poop Monkeys live in? Trees. They live in trees. Much of this advice also applies to book signing events. I was a basket case leading up to the release of my book. My stress level reached 2.5 on the wedding-day jitters scale, equal to 3.2 oh-god-it’s-the-math-final-exam-and-I-never-showed-up-to-class nightmares. Publishing a novel was terrifying for me. I was confident that it would succeed, but there was still that nagging doubt that I was deluding myself. What if my beta readers lied to me? What if I’m not just the hack fraud I know myself to be? What if I’m a talentless hack fraud? Added to the usual anxieties of an event like this–What if no one shows up? What if I forget to zip my fly again?–it was enough to keep me up at night. My wife was a big help; she prepared great snacks and was kind enough to handle the kids (it was important to me that they be there). I combated my anxiety by taking control of what I could and trying to forget about the rest. Here are a few things I did to get ready for the event. I’m talking about an in-person launch, not a virtual/online launch, which I didn’t pull off nearly as well. But my meat-space book launch was phenomenal. I decided there were two ways to handle a book launch party: (1) a private event, where I beg all my friends and family to show up, or (2) a public event, where I beg all my friends and family to show up, but I also have the opportunity to sell books to the public. If I were traditionally published, I might have gone with option 1. But I need all the exposure I can get, so I went with a public event. You want a place with plenty of foot traffic, and where people are thinking about buying stuff. My grandfather-in-law Ken Wampler has a gallery at the Sunset Galleries, which is an old mall that’s been converted into studio and gallery spaces. It’s well known around town because of the Art Walk, a free event held the first Friday of every month. Ken was generous enough to let me set up shop in his gallery, and I sold books to familiar and unfamiliar faces all night. Many of the galleries have snacks for people, and the cupcakes my wife made also brought in folks. It was a successful venue choice for me because it’s a recognizable location and there would be a crowd even if no one I invited showed up. Which brings me to the next thing. Everyone who cares about you needs to know about your book launch.You want to get the word out through social media to the point where you’re worried you might be annoying. You know when your Facebook friends keep talking about their wedding or the imminent birth of their child? This is that important, and you shouldn’t feel bad for being excited, because it’s no one’s job to be excited for you. Whatever you’ve got, make it an invitation to your launch. Twitter, your mailing list, everything. The most successful ways I reached out to people was in person and through Facebook, and I think I pulled it off without being annoying. If I talked to someone in the couple of months leading up to the launch, you can bet I mentioned it. As for Facebook, I invited everyone on my fan page and everyone on my friends list. Was it a bit spammy? Maybe. But this was a major milestone for me, and if people can’t be bothered to know about it, do I really need them as a friend? I also sent out press releases, which actually netted me an interview with a local radio station, Mix 94.1, which was cross-posted to its sister stations. I’ll go into detail on press releases another day, as it was worth the time I put into it. All of this effort meant that I had a huge group of encouragers and supporters show up for my launch, in spite the terrible storm we had that night. If you have enough people planning to come, you’ll survive missing the folks that couldn’t make it but wish they could. There were many people who showed up because they’d heard about it from someone else. It would be worth your time to make a list of people that would tell others to come, and make sure they know the details whether they can come themselves or not. It could be worth making flyers just to pass on to these type of people. THINGS I COULD HAVE DONE BETTER: If I’d had time, I could have posted flyers at local libraries and coffee shops. I was just too slammed for time to do it properly. And as I said, I didn’t really do any kind of virtual launch party, and I should have. I also didn’t post on community event bulletin boards or Craigslist, although I did post on my local subreddit. My penmanship brought my elementary teachers to tears. Realizing a major component of my authorial first impression would be how I signed my book, I needed to take drastic measures. 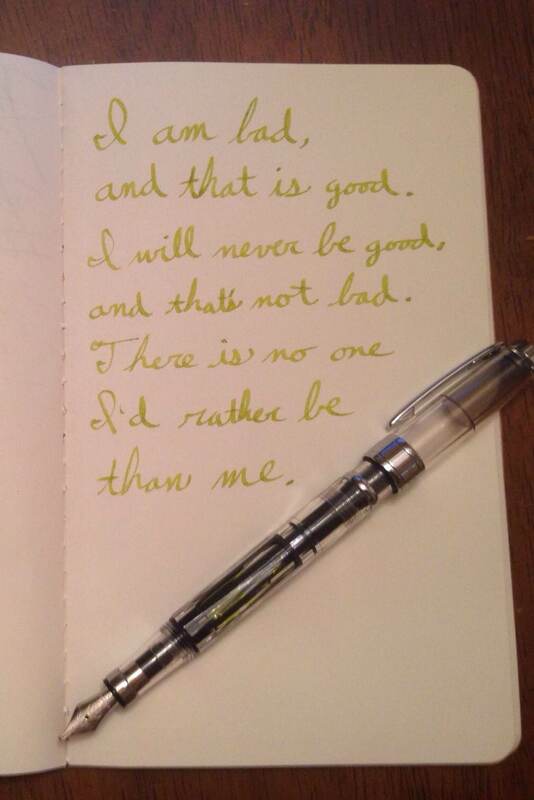 I bought a reasonably-priced fancy pen–TWSBI Diamond 580 Clear Fountain Pen, 1.5 mm stub nib–and a bottle of J. Herbin olive-colored ink. You can also get very cheap, usable Chinese fountain pens from eBay if that’s your thing. I practiced my signature like a middle-school kid. Armed with a list of my favorite quotes, I was ready to inscribe me some books. Quite a few folks complimented the presentation, which is the most narcissistic thing I’ll say today. I might have cried at this part in Wreck-It Ralph. When you sign a book for someone, talk to them. This is your chance to gather information for when you eventually steal their identity. Ask who you want it made out to. Be sure how to ask how to spell their name, even if it seems obvious. If it’s a couple and it seems appropriate, ask if you should make it out to both of them. Make sure people know what you’re doing. Have as huge a stack of your books as you can get. I had a large canvas version of my book cover, which attracted a lot of attention. I made a cool sign using old frames and chalkboard paint, but it broke as I loaded it into the car! Maybe I’ll post it once I get it fixed. You can also get a retractable display by googling or shopping locally. It’s basically an upside down projector screen, with the screen being the sign. They look first rate, are very affordable, and you can print different signs to reuse them. I’ll probably get a couple down the line. You’ll also want to have your business cards available. Little stands for cards, prices, and a hashtag are available at office supply or craft stores. I also printed up several of the masks from my book cover and put them on sticks for photos. It looked cool, but not many people took advantage of it. You need a way to keep track of sales. I had a tally mark system that fell apart as soon as things got hectic, but I was able to track my numbers by the number of books I had left and the amount of money I took in. I had a receipt book, but no one wanted a receipt. Make sure to have prices visible, and make them round numbers if you don’t want as much hassle with change. I rounded to the the nearest $5, so I only needed $5 bills for change. Make sure you have something to keep your money in–it would be real easy for it to walk off. You need a way to take debit or credit cards. The most popular way is to use Square or Paypal on your smart phone. They provide a free card scanner that plugs into the headphone jack. Make sure you can get a signal where you’re at, or get access to the Wi-Fi. Are You Selling Digital Copies in Person? I’ll go more in depth on this with another post (Here it is! – future Ryan), but I sold digital copies at my launch. I printed up postcards with the cover on one side and contact info on the other, which gave me something to sign (I used a silver Sharpie). People that purchased the digital book put their email on a list and had the option to opt into my mailing list. I later emailed them the mobi and epub files and instruction on how to install them on most devices. I no longer sell digital files directly, because I’ve become part of the Kindle Select program. Take a Deep Breath and Have Fun! Once you’re there and set up, most of the stress is no longer applicable. Relax, spend time with friends and family, and meet some new people that might become your biggest fan. Encourage folks to post to social media and leave honest reviews when they’re finished. You’re usually working alone in the dark, so have a good time being an author in public. “How’d the Book Launch go?” and updates. I’ve been neck deep in requesting reviews, and it’s slowly paying off. I have a guest post on the illustrious Longbox Graveyard: The Influence of Sequential Art on My Novel or: How I Shoved Comics Into A Book Without Pictures. I talk about some of my favorite comics and their influence on Monsters All the Way Down. I’m a fan of Paul’s site and his Twitter shenanigans, so I was excited to contribute. Despite the rain trying to wash us away, the book launch on September 5 was a huge success. 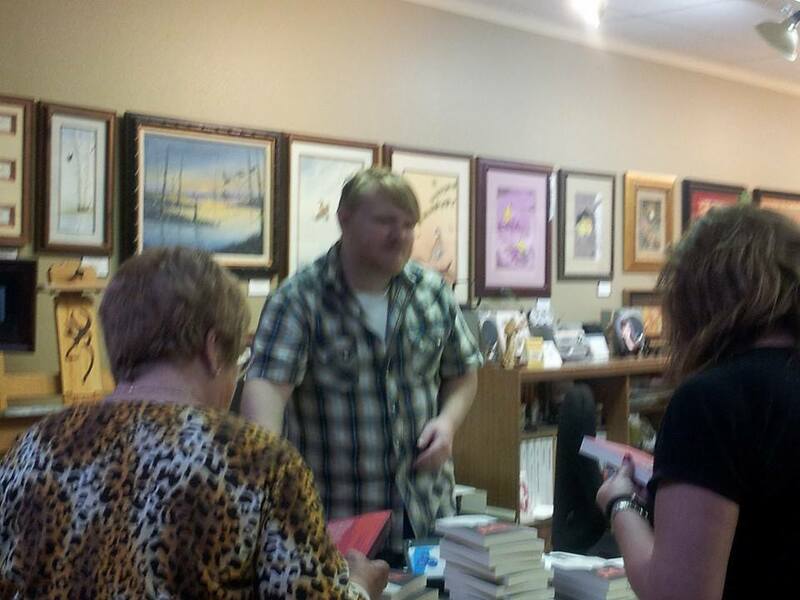 From the moment I set up shop, I was chatting with folks and signing books. I really appreciate everyone that braved the storm to make it to Sunset Galleries, and a huge thanks to Ken Wampler for hosting the launch at his gallery! I almost drowned, but I sold books. I was a total basket case leading up to the launch, and my wife did an amazing job putting up with me. I don’t get stage fright, but releasing a book was terrifying. Looks like I was worried over nothin’, because the response has been excellent, and I’m looking forward to reading the reviews over the coming months. As for the future, I have a few short stories that are almost ready to leave the nest. The current big project is the next novel, which is in revisions. The plan is to get through a few drafts by the end of the year so I can run a Kickstarter in the spring to pay for illustrators. Coming up on the blog in the next couple of weeks will be posts on “How to Feel Like A Real Big Shot Author at Your Book Launch” and on my work with Josh Jordan and PK Sullivan on the Tell Me Another podcast.